PreCoat F31/20 is suitable for the treatment of substrate steel, aluminum and galvanized steel. PreCoat is a chemical treatment applied directly after grit/sand blasting or metallization (also referred to as metal spraying). AD Chemicals launches a revolutionary product (PreCoat F31/20) on the global market for metal products that are mechanically pre-treated prior to the coating process (wet- or powder paint). PreCoat F31/20 is suitable for the treatment of aluminium, steel, hot dip galvanized and metalized steel. the corrosion-resistance properties of the paint system as a whole. With PreCoat one can easily obtain a quality level that complies with international standards such as Qualicoat, Qualisteelcoat and GSB. The product is also approved by major paint manufacturers. The application procedure of PreCoat is very simple and can be easily integrated in most business process. The innovative character lies in the fact that it combines the strengths of a mechanical and chemical pre-treatment. Furthermore, the product is free of hazard labels and chromium (VI)- free. The correct use of PreCoat will thus not have a negative effect on people and their environment. 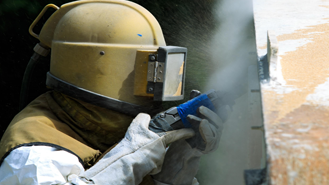 The PreCoat F31/20 procedure can be integrated easily in every grit/sand blasting companies its business processes. It is applied directly after grit/sand blasting or metal spraying. The application procedure. Salt spray testing is an accelerated corrosion test that produces a corrosive attack to coated samples in order to evaluate (mostly comparatively) the suitability of the coating for use as a protective finish. The appearance of corrosion products (rust) is evaluated after a pre-determined period of time. Test duration depends on the corrosion resistance of the coating; generally, the more corrosion resistant the coating is, the longer the period of testing before the appearance of corrosion/ rust. The salt spray test is one of the most widespread and long established corrosion tests. The salt spray tests are executed in accordance with ISO9227/ Din50021/ ASTM B117. This demonstration video shows the easy application method of PreCoat and obtained test results.